Unless you’re a staunch advocate for your kids having zero screen time, at some point you’re going to distract them with a mobile device. 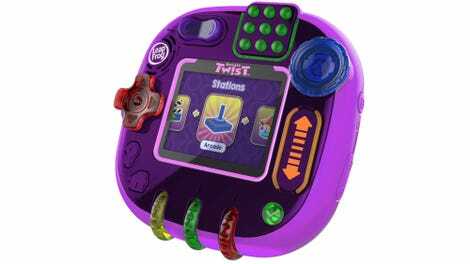 But instead of putting your expensive, fragile smartphone in their hands, LeapFrog’s new RockIt Twist is like a baby’s first Game Boy that makes gaming more accessible with a bunch of kid-friendly controls like wheels, dials, switches, buttons, and sliders. Even though the included roster of games is definitely geared towards kids as young as four-years-old, there’s something about the RockIt Twist!’s gratuitous use of physical controls that appeals to me and my disdain for touchscreen controls. I want buttons – lots of them – and I want my kids to grow up with an appreciation for buttons and physical controllers as well. If it serves to improve their hand-eye coordination in the process, then all the better. A girls version of the RockIt Twist! probably wasn’t needed given the game content is the same. Coming from a company that’s focused on edutainment, LeapFrog has geared the RockIt Twist!’s games towards learning, with titles that help teach maths, problem-solving, reading, and science. But instead of using high scores or new levels to encourage kids to keep playing, the handheld also includes a collection of virtual pets that grow as kids work through the challenges. You’ll probably still feel guilty about letting your kid stare at a screen while you take a breather for 20 minutes, but slightly less so because they might learn something in the process.